Was your trucking company hired by this broker? 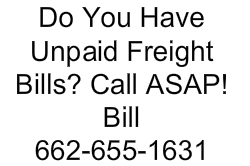 If you’re having a hard time reaching out to PMT Logistics LLC in regards to unpaid freight bills, call 901-300-7460 and ask for Bill right now! Were you hired to deliver freight on behalf of this brokerage? If you’re trying to reach out to Throttle Lane Brokerage about getting paid for your services, call today! Were you ever hired to haul freight for Translink, Inc? If you’re trying to get paid on Translink Inc debt, call ASAP! Does this broker still owe you for unpaid freight bills? If you’re trying to get paid on GLW Transport Incorporated debt, pick up the phone and call today. Have you delivered freight for this company? Have you been trying to get paid for your service but can’t get in touch with them? If you have 5K Logistics debt, call . Trying to get the money you’re owed from this broker? If you’re trying to get paid on Leading Edge Logistics LLC debt, call now for help. Does this broker owe you money?